A rabbit and hare have become more or less synonymous for many. The difference mainly pertains to their physique, lifestyle and food habits. Hares are bigger than the rabbits. They are swifter than the rabbits too. The hares have longer ears and hind legs than the rabbits. The newborn hares are covered with a full coat of fur. They come out of their mothers’ womb with their eyes open. The young ones are dropped by their mothers at the birth to a small depression in the ground. A young hare is often called a leveret. A rabbit is born hairless unlike the hares and also blind. A young rabbit is called bunny. The mother gives birth to the young ones in a nest that has been carefully constructed with grass, tender stems and tree bark. Over this soft cushion, the mother spreads a layer of fur that she takes from her skin. Once the bunny is in the nest, the mother is careful enough to wrap it with more hair and leaves to keep the young one warm and comfortable. The rabbits and hares though different in many respects do share many commonalities. Both the mammals molt their hair twice a year, in the fall and in the spring, which will be replaced with another new coat of fur. But here comes the difference in terms of the color of the fur which undergoes the seasonal change. The brown coloration of the rabbit fur that happens in the summer changes into grey. The hares that normally inhabit the cold regions turn white as snow in the winter. Rabbits and hares are nocturnal animals. They are most active from the time that falls between dusk and dawn. They keep low in the daytime. While the rabbits bury themselves deep down in the burrows or depressions during the daytime, the hares hide among the plants. They run away when confronted with the predators. Rabbits move in groups. There exists competition between the male rabbits within a group to claim ascendancy. This is how they try to ‘win over’ their female counterparts and the emergent victor mates with most of the females in the group. The hares are in direct contrast to the gregarious rabbits. The hares are solitary animals that live by themselves. The only time they group up is for mating. The hares are a peaceful group since there is no ‘infighting’ among the hares for mates. A hare is in a sense a wild animal. The rabbits are domesticated and are grown as pets. While rabbits feed on soft and tender food items, hares are ‘tough’ in that they feed on hard materials. Hunters prefer hares to rabbits as they are tastier than the rabbits. 1.Hares are bigger, swifter and stronger than rabbits. Hares are born with a fur coat and can see while the rabbits are born blind and hairless. 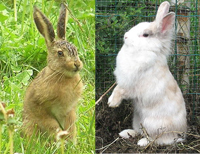 2.While hares live in the wild, rabbits are domesticated. 3.The hares dwell in burrows while the rabbits live in nests constructed above the ground. The hares flee once they encounter the enemies. 4.Hares are solitary animals while the rabbits are gregarious. lancetana. "Difference Between Rabbit and Hare." DifferenceBetween.net. May 19, 2011 < http://www.differencebetween.net/science/nature/difference-between-rabbit-and-hare/ >. Above you say that a rabbit “gives birth to the young ones in a nest that has been carefully constructed with grass, tender stems and tree bark.” Then in the wrap-up, you say that rabbits dwell in burrows and hares live in nests. I read elsewhere that one difference of hares and rabbits was that rabbits build nests and hares do not. Which is true? a baby rabbit is called kit. “bunny” is just a pet name for rabbits. Hares don’t live in burrows – European rabbits do. Cottontails also live above ground. statement #3 (“3. The hares dwell in burrows while the rabbits live in nests constructed above the ground”) contradicts paragraph #5 (“While the rabbits bury themselves deep down in the burrows or depressions during the daytime, the hares hide among the plants.”). i have a pet rabbit and cotten tails do live above ground to so ya plus hares dont lie under ground theire whole life.